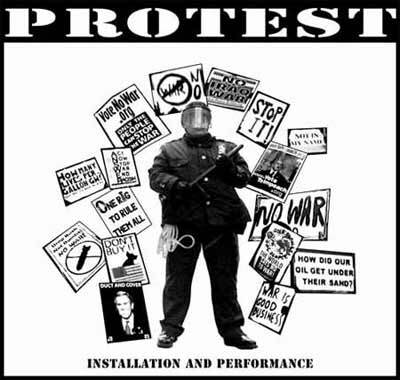 "Protest 2004" is a 4 channel video installation/performance/street intervention work featuring two interacting elements. 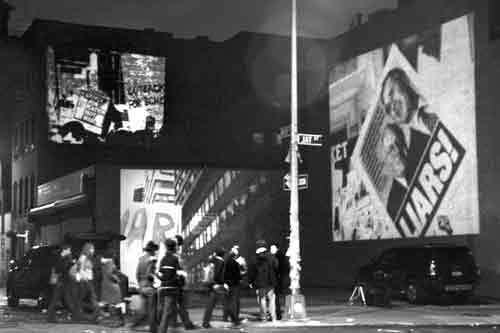 The first element is a group of three video projections on buildings, depicting crowds protesting the Iraqi war in New York City. They are accompanied by looped protest chants. The second element features a roving "Drive-By" projection of the NYPD interactions hitting the buildings around from a moving dark SUV, projecting images from the same protest rallies, but this time concentrating on the police interactions with the crowd. Sounds from police loud hailers, sirens etc. emanate from the car. The three projections are fixed and continue uninterrupted until the roving car drives by and blasts the images of the police over the existing images and upsets the chanting with its noise. "Protest" is, in part, a "Drive-By" performance. To view other Drive-By performances, click on back to Drive-By below.